This bowl, with its thin walls, careful construction, and lustrous black polish, exemplifies the craft of famed San Ildefonso potter Maria Martinez. Its simple, unadorned form illustrates Maria’s expertise in shaping the earth of her native land, a mixture of dried clay and volcanic ash. She began creating blackware pottery in 1912, adopting a traditional style of the Pueblos of San Ildefonso, Santa Clara and San Juan (Spivey 2003,13). Potters attained this black finish by smothering their wares with ash or manure during the firing process (Peterson 1997, 49). However, Maria managed to achieve a glossier surface on her pots because of her superior polishing skills in combination with lower firing temperatures (Spivey 2003, 29). 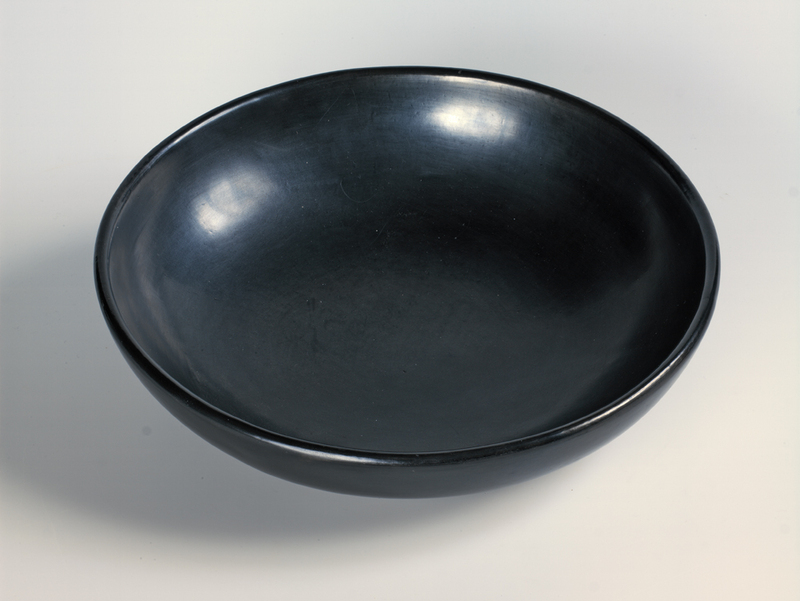 By continually practicing and experimenting with different techniques, Maria and her husband Julian developed innovative black-on-black ware in 1919, which soon became the established style at San Ildefonso and set Maria apart as a world-renowned potter (Bernstein and Brody 2001,13). In drawing upon ancient techniques, she created a novel tradition of her own. In addition, Maria was a wife, mother, and member of the Pueblo community (Spivey 2003, xv). She loved people and shared whatever she could, including her blackware techniques. By inspiring other potters and popularizing Pueblo pottery in consumer culture, Maria facilitated the recognition of San Ildefonso as a leading art center (Spivey 2003, 43). As clay links one to the earth, Maria connected tradition with innovation, ancient with modern society, and the Pueblo with the outside world.